Injuries involving bones, muscles, ligaments, and cartilage can be common occurrences during sports, work, or even normal daily activities. Because these injuries often have a direct impact on our activity level, accurate diagnosis and treatment by an experienced orthopedic surgeon can be critical to ensure an optimal and timely recovery. However, it is an unfortunate fact that some people allow themselves to suffer with a painful or activity-limiting injury for a very long time before they seek medical care. Steven Meier, MD is a board-certified orthopedic surgeon in Beverly Hills with fellowship training in advanced sports medicine and arthroscopic procedures. As one of the leading orthopedic experts in Los Angeles, Dr. Meier is routinely sought after by patients for his minimally invasive and cutting-edge approaches to a variety of musculoskeletal injuries when it is clear that surgery is necessary to alleviate pain and restore function. The following list briefly details some of the more common injuries seen by Dr. Meier, as well as the treatment and recovery process that is typically involved with the injury. Please click on any of the links below to read more about each of the injuries listed! Rotator Cuff Injury – The rotator cuff is a group of muscles and tendons in the shoulder that can become partially or completely torn through stress or overuse of the shoulder. Based on the extent of damage, treatment for rotator cuff tears may include physical therapy, steroid injections, or arthroscopic shoulder surgery. If you are interested in undergoing rotator cuff surgery in Los Angeles, Dr. Meier specializes in the most cutting-edge techniques and can help you on your way to recovery. Shoulder Dislocation – Shoulder dislocation is a condition involving the upper arm bone dislodging from the shoulder socket, and is often caused by a traumatic blow to the shoulder, such as falling from a ladder. After restoring the bones to their proper position, some cases require further treatment and extended therapy to repair associated damage to the shoulder joint. Shoulder Separation – Also known as an AC joint separation, this injury involves displacement of the collarbone from the top of the shoulder blade. Shoulder separations are commonly sustained during contact sports but can also occur when falling onto an outstretched arm. Most cases do not require surgery, unless the injury is severe. Knee Ligament Injuries – The four main ligaments of the knee (ACL, MCL, PCL, LCL) stabilize the joint against abnormal movements. Ligament injuries often occur when twisting on a planted knee or landing improperly on the leg. Minor tears can be treated with rest and physical therapy, while major or complete tears often require surgical intervention followed by extensive rehabilitation in order to restore normal function to the knee. Meniscus Tear – This is one of the most common knee injuries involving damage to the wedges of cartilage (menisci, in plural) which lie between the upper and lower leg bones and cushion the joint. Meniscus tears can be due to an acute event, such as abrupt twisting or a traumatic blow to the knee, or they can also result from fraying and tearing of the tissue from constant stress on the knees. Treatment for these types of tears depends on the severity and location of the tear. Arthroscopic treatment of the meniscus is recommended in the event that more conservative therapies have failed and pain or dysfunction are still present. You can learn more about treatment for knee injuries in Los Angeles by contacting our office. Osteoarthritis – Osteoarthritis is mainly an age-related form of arthritis in which joint cartilage becomes inflamed and worn down over time. It is more common in individuals with jobs that require extensive movement (walking, stair-climbing), heavy lifting, or consistent stress on the joints (kneeling, squatting). Treatment for osteoarthritis depends on many patient-specific factors and therefore is determined on a case by case basis. Therapeutic options can include steroid injections, physical therapy, activity or diet modification, cartilage restoration, or, in very severe cases, joint replacement surgery. Bone Fractures – Fractured bones in the upper and lower extremities, such as the arm or leg, are common injuries that can occur for a variety of reasons in the workplace. Approximately 5% of fractures require surgical repair, while the rest may be able to heal naturally through rest and temporary immobilization of the affected area. Carpal Tunnel Syndrome – Carpal tunnel syndrome occurs when the median nerve running through the wrist becomes chronically compressed, causing pain, tingling, and numbness in the hand and fingers. Carpal tunnel syndrome is often the result of repetitive hand motions such as gripping or typing. More severe cases, ones that have been worsening over years, may require carpal tunnel release surgery to relieve pressure on the affected nerve. For a more complete list of orthopedic conditions and sports-related injuries treated by Dr. Meier, including 3D animated videos of the treatments involved, we invite you to visit the MOSM patient education center! Dr. Steven Meier is a board-certified orthopedic surgeon with fellowship training in sports medicine and arthroscopic surgery. 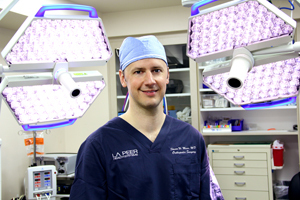 As a leading authority on cutting-edge orthopedic procedures, Dr. Meier offers a variety of minimally invasive and joint-preserving techniques for the treatment of orthopedic injuries, particularly of the knee and shoulder.